rec. November-December 2013, Warsaw, Polish Radio. Toccata continue to thrust out in new and market-treacherous directions. Unafraid of the wagging finger of commercial wisdom they are fixed on musical values that others find unaffordable. They even indulge in and carry through multiple volumes of high risk projects and composers. It's to be applauded and wondered at. This seems to be the first disc entirely dedicated to Bauer's music. Their latest 'alumnus' is Polish composer Jerzy Bauer, born in Lodz and grouped with Penderecki, Górecki and Kilar. His parents were German and Polish as the name suggests. A degree from Lodz pitched him forward to Paris where his mentors were Boulanger and Messiaen. He has written in every genre apart from opera and electronic music. 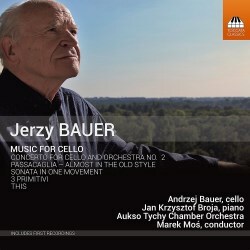 Andrzej Bauer, the son of Jerzy, is a leading cellist in Poland following in the footsteps of Jerzy who also has a strong command of the instrument. I liked Toccata's characterisation of what we hear: "mild modernism showing a respectful engagement with the music of the past". The liner-notes are in English only and are by Rafal Augustyn. These are fulsome and tell us that the Cello Concerto featured here is a modified version (2013) of a First Cello Concerto (1985). The First had four movements while the Second removed the third movement from the earlier work. The movements are: Emanations; Interludium; Analecta. The Cello Concerto is a work of hothouse intensity and oozing warmly dissonant melody. The music of Emanations flitters in evocation of some surreal world while the second movement plays delicate impressionistic games. Interludium is a striking creation set amid two movements prone to grit and fury. That said, the final Analecta finds its way back to the pristine dreams and quasi birdsong of the middle movement. The father's music is in the hands of his son, Andrzej. The Three Primitivi for piano and orchestra are from almost a quarter century before the Concerto. They mix what sounds very much like 1960s avant-garde (lightly applied) with a bumpy boogie-woogie kinetic flight. At times it's almost Gershwin. The composer refers to these pieces as drawing on the rhythms of the African people. The piano usually carries that unsophisticated element. Like the Concerto the Sonata in One Movement for cello and piano is linked to Andrzej's life and career and was written for his diploma concert. It's quite short. Again those soberly presented aggressive rhythms from the piano contrast with the cello's dramatic linear progress and lyrical duties. It has been recorded before on Dux. The Passacaglia - Almost in the Old Style does not crack a smile, neither does the composer intend one. This is serious business with the music veering more towards darkness than direct light. We end with a short scena simply called This. This disc joins Toccata's other noble forays into Polish music including Tadeusz Majerski, the orchestral music series of Weinberg (at least six discs) and André Tchaikowsky. A Polish modernist, but not a garrulous one, and certainly a fine craftsman.